Scottscope: Children Beware! Death Kappa is Coming! Children Beware! Death Kappa is Coming! 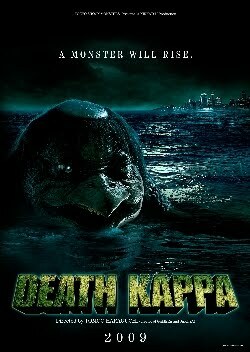 Arriving in the states just in time to capitalize on my current fascination with Kaiju films is Death Kappa. What is Death Kappa? It's a spoof of the Kaiju genre directed by Tomo Haraguchi, who did the special effects for two of the "Heisei era" Gamera films. The Kappa of the title is a water Imp who dines on small children. It will be showing at this years New York Asian Film Festival and will be receiving a DVD release on July 27th courtesy of Media Blasters "Tokyo Shock" Imprint. This outrageous trailer sells the film perfectly. One can imagine it preceding an exploitation flick double feature at the local drive in or grindhouse back in the 1960's. This film is clearly designed to be viewed with a crowd of like minded souls, whether it be opening night at the multiplex or a Saturday night at home with close friends. I can't imagine that it will live up to expectations, but many people said the exact same thing about Black Dynamite last year. man i thought this was gonna be about a frat member who got killed screwing the wrong girl and coming back from the dead. i figured he'd get his revenge by killing the ones who murdered him by beating them with his krimson and kreme kane, then chant as the others find the bodies one by one. but the actual movie looks just as crazy. At Long Last...The Bobby Digital Movie!